The city has proposed closing down the Foreign Language Academy of Global Studies at the end of the school year. MOTT HAVEN — A South Bronx high school struggling with extremely low graduation rates and student enrollment would be shut down at the end of the academic year under a new proposal from the city. 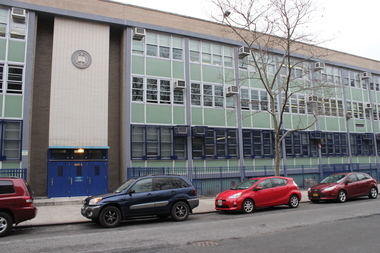 The Foreign Language Academy of Global Studies, located at 470 Jackson Ave. in Mott Haven, currently employs 16 full-time teachers and serves 101 students in grades nine through 12, making it the high school with the fourth lowest enrollment throughout New York City, according to the Department of Education. The school, which opened in 1996 and focuses on foreign languages and global cultures, has seen a 55 percent decline in enrollment since the 2012-13 school year, and only 2 percent of its students graduate ready for college, according to the DOE. FLAGS is also unable to provide its students with basic courses in math, English, science and social studies without supplemental funding and can only offer them limited academic enrichment programs, leading to a steady decline in academics and a decreasing graduation rate that is more than 20 percentage points below the citywide average, the DOE said. Additionally, only nine students listed FLAGS as their top choice in the first round of high school admissions for the 2016-17 school year, according to the DOE. The possible closure is still subject to the approval of the Panel for Educational Policy, which will consider the matter at its meeting in April. If approved, FLAGS will completely shut down at the end of the current school year, as its enrollment is too low for a phased closure, the DOE said. Letters about the closure are being sent to families on Thursday, and they also should have already received a call about the issue, according to the DOE. The department plans to host a town hall for the school community as well. All students from FLAGS will receive individual support from the DOE to help them find a suitable new school for next year, and they will have access to available seats from across the city, according to the agency. The DOE's Human Resources department plans to work with the school's principal and teachers to find new jobs for them, and officials expect to find spots for most teachers. The principal at FLAGS declined to comment on its possible closure. “We have to hold our schools accountable for raising student achievement," DOE Chancellor Carmen Fariña said in a statement. "When a school’s enrollment is persistently low—and continues to decline—it simply cannot provide the services students need to thrive."